Cuisinart's Classic Stainless 14-inch Stir Fry is part of its new variety of specialty pieces offered in their Chef's Classic Stainless Cookware series. These specialty pieces make everyday cooking tasks a pleasure. You may wonder how a stir-fry pan is different from a skillet. First of all, the gently sloped sides of the stir-fry pan allow you to quickly rotate or stir ingredients in the pan without worrying about the meat, vegetables, or sauces spilling over the sides. Plus, the Cuisinart Stir-Fry's smoothly tapered rim eliminates drips and spills while pouring. The pan's aluminum encapsulated base heats quickly and evenly eliminating hot spots that would burn your food. And the tight fitting stainless steel lid seals in moisture and nutrients for healthier, more flavorful food. Because the Cuisinart Stir-Fry is oven safe to 550 F, you can use it on the stovetop, in the oven, or under the broiler. It's also freezer safe for easy storage. Talk about versatile. And it's attractive to boot. 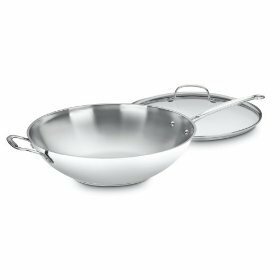 The Stir-Fry pan is made of 18/10 mirror-finished stainless steel giving it a polished, professional look. It performs professionally, too. The cooking surface does not discolor, react with food, or alter flavors. Stir-fry is a quick, healthy, and flavorful one-dish meal that the whole family can enjoy. And it's easy to make when you have an easy-to-use pan like this one. Plus it comes with a lifetime warranty. What more could you ask for?